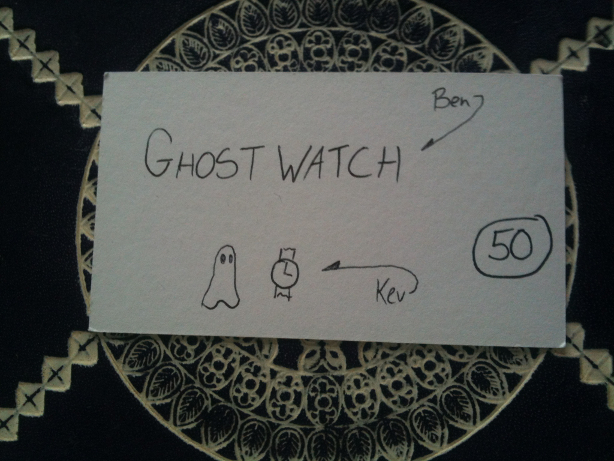 Ghost Watch! Host Rami Spectre guides a group of talented young ghosts as they compete for a place on the Fabulous “Haunt This!” tour. A technology-enhanced paranormal investigation LARP in which the players navigate a haunted house to try to figure out the hauntings. A watch which captures the spirit of someone who dies while it’s in their possession, locked to the hour in which they died. An improv exercise in which the players both create a group of ghosts, and tell the tale of the group of people who discover them. Teams of working spectres whose job is to lure TV crews and high-profile ghost hunters away from the really dangerous poltergeists by giving them entirely unrelated paranormal activities to chase. A gameshow broadcast in the Netherworld, in which contestants have to stop Ghost Hunters from obtaining any proof of the paranormal.